Benjamin Franklin is credited as saying the only things certain in life are death and taxes. Taxes come in an array of forms: petrol tax, excise duties, import duties, estate duty, transfer duty, dividend tax, VAT and income tax. The subject is complex and difficult so in this article I will give an overview of the issues one needs to manage as a business owner and provide some ideas in order to minimise the time and effort required to remain compliant. Employees include normal monthly paid or weekly paid personnel, executive directors of companies, and partners in a business drawing a salary. A business, whether a sole proprietorship, partnership, close corporation, or limited company is required to register all employees for income tax (PAYE) and the Unemployment Insurance Fund (UIF). The business must itself register as an employer with the South African Revenue Services (SARS) and each employee requires a tax number failing which they must register themselves by visiting a SARS branch with a copy of their ID, proof of address and banking information. SARS recognises tax practitioners who can represent both the business and the employee in their dealings with SARS. As a registered taxpayer the individual can sign-up to use the SARS eFiling service which allows him/her to file returns for themselves or their business, make payments to SARS and generally simplify all transactions with SARS. The returns required to be filed monthly with SARS are EMP101 declaring the amount of PAYE deducted from its employees, the UIF deducted and contributed and the SDL (skills development levy where applicable). Every six months an EMP501 is required to be submitted. This is a reconciliation of the tax certificates issued for half the year and for the full year to the returns submitted and the amounts paid. 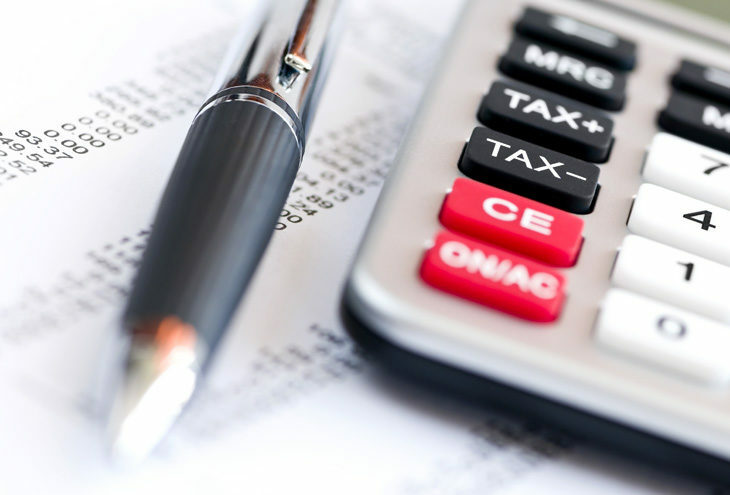 Although the payroll can be prepared manually it is recommended that a computerised payroll system be used which will calculate the correct tax, produce the payslips and the half yearly EMP501. There are many systems available most at very reasonable cost. From July 2018 all registered taxpayers have to complete an IT12 if they have more than one source of income or they wish to make deductions against their gross income. An individual’s final tax bill is based on their net income which is calculated on all sources of income less deductions and exemptions. Income can be in the form of a salary, fringe benefits, profits as sole proprietor, investment income and net rental income. Deductions can only be claimed if they are specifically legislated or are incurred in the course of generating income. Medical deductions and retirement deductions are legislated for while expense claims need to be justified. Please note that if you wish to maximise your deductions in accordance with the travel allowance tables, keep a log book of your travels. All the income sources are added together so that if the taxpayer earned a salary but at the same time made a loss on an entrepreneurial venture in his or her name the loss can be set off against the salary earned. 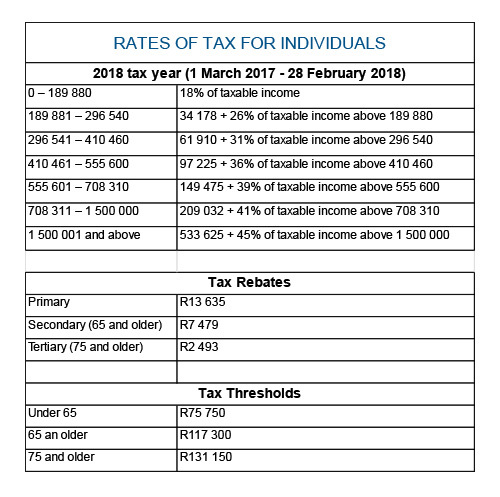 The following table shows the rates of tax applicable for individuals for the tax year ending 28th February 2018 and the rebates that will be deducted from the resultant calculation. 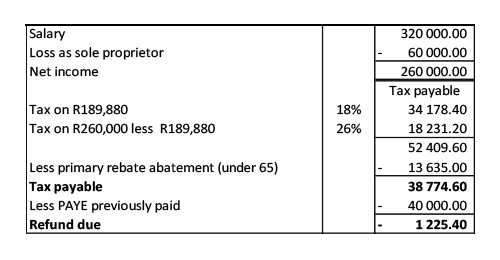 Thus an individual under 65 will pay tax when his taxable income exceeds R75 750 and a person over 65 but under 75 will pay at a level of R117 300. To give a simple example. Mary earned a salary of R 320,000 from her previous place of employment from which PAYE of R40,000 was deducted. During the same fiscal year Mary opened her own beautician shop under her own name (not a company) which recorded a loss for the period to end February of R60,000. She has no allowable deductions. The Cloud Accountants are proud Premier Members of the NSBC.